Two after-class brawls outside of Lakeview High School last week have officials promising extra security and additional precautions to prevent a repeat performance in the days ahead. The first incident was reported around 4:20 p.m. on Wednesday in the 3900 block of North Ashland. A group of students from Lakeview was said to be in in a fight, which police broke up. No arrests were made. The scene was different following school on Friday. Four juveniles were taken into custody after "disturbances" broke out on streets near the school at 4015 North Ashland. 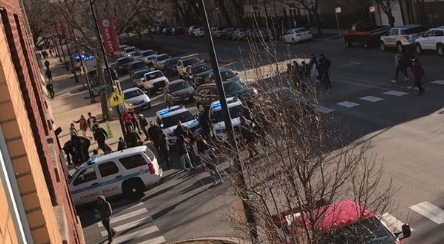 Chicago police today said only that "200 to 300 students walked out" of Lakeview. Video posted to Reddit shows about six police vehicles at the corner of Ashland and Belle Plaine during Friday’s incident. Most of the police activity was a block south near the Popeye’s restaurant at 1600 West Irving Park Road and inside a nearby Starbucks. Karafiol said the school will be taking “extra measures” in the coming days. “We will have a stronger police presence and our security officers will ensure the perimeter of the building is clear before we release students,” he said. Three boys and one girl were taken into custody by police on Friday afternoon, but the department had no information about any charges being filed against them. CWB coverage of Lakeview is made possible by our subscribers. Join now for just $49 a year or $5 a month. Members receive a year’s worth of exclusive reports and services.